Dhaka, 6 Feb, Abnews: The pressure on Chelsea manager Antonio Conte intensified as his 10 men suffered a second consecutive humiliating defeat on Monday, going down 4-1 at Watford. Goals from Daryl Janmaat, Gerard Deulofeu and Roberto Pereyra in the final six minutes handed Watford a welcome first win in six games to move the Hornets six points clear of the relegation zone. Chelsea, beaten 3-0 at home by Bournemouth on their last outing, had already been reduced to 10 men by Tiemoue Bakayoko’s first-half red card before Troy Deeney’s penalty put Watford in front just before the break. Eden Hazard’s brilliant strike eight minutes from time briefly handed the visitors hope, but they remain fourth, just a point ahead of Tottenham Hotspur, with Conte’s chances of remaining in charge for the rest of the season under the spotlight. Conte insisted ahead of the match he intended to see out his contract to 2019 despite a series of complaints this season over his lack of influence over the club’s recruitment strategy. The Italian once again named a side without a recognised striker with new signing Olivier Giroud only deemed fit enough for a place on the bench in the absence of Alvaro Morata due to a back injury. A makeshift front three of Hazard, Pedro Rodriguez and Willian struggled to get involved as Watford dominated on new boss Javi Gracia’s home bow. Abdoulaye Doucoure dragged a shot wide when well-placed from the edge of the area before on-loan Barcelona winger Deulofeu came close to marking his home debut in style when he smashed into the side-netting. The chances kept coming for Watford as captain Deeney then fluffed his lines when found completely unmarked at the back post from a corner. Having been let off by Watford’s wayward finishing, Chelsea weren’t handed such a reprieve from referee Mike Dean as Bakayoko’s miserable first season in England continued. The French midfielder was dismissed for two bookable offences within five minutes to leave the visitors a man light for the final hour. Conte immediately responded by replacing Willian with Cesc Fabregas. However, that did little to stem Watford’s tide and they went in front when Thibaut Courtois brought down Deulofeu as he rounded the goalkeeper. Deeney made amends for his previous miss by burying the resulting penalty into the bottom corner. Watford continued to pose the greater threat after the break as Deulofeu and Richarlison sent shots inches wide of Courtois’ left-hand post. The Belgian keeper then had to be at his best to turn Doucoure’s drive behind. 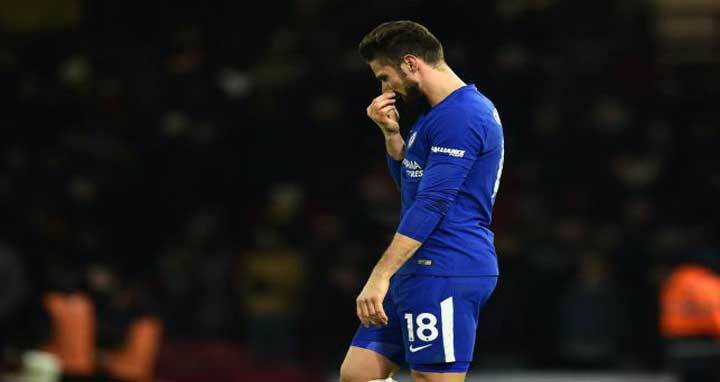 Giroud was finally handed his debut for the final 25 minutes in place of Pedro, who hobbled off with a nasty looking injury that could make him a doubt to face old side Barcelona in Chelsea’s Champions League last 16 tie in two weeks’ time. An individual moment of magic from Hazard gave Chelsea hope when he curled into the far corner from 25 yards for his 13th goal of the season. Parity only lasted two minutes, though, as Janmaat played a brilliant one-two with Pereyra before slotting past a helpless Courtois to spark wild scenes of celebration at Vicarage Road. Deulofeu sealed the points two minutes later when he fired across Courtois with Chelsea’s tired defence pulled apart.